Our commitment to quality and service ensure our clients a pleasant experience every time. With 24 years of experience and continuing education, Julie Campbell has put together a dedicated, expertly trained staff ready to serve you . Here, at the Clinic, we will first evaluate your skin and nail condition and then prescribe a treatment program specifically to fit your individual needs. Our comfortable, relaxed atmosphere is designed to make you feel like you're with family! Come join us at the bar! And find out why we have been voted the BEST in Naples! We accept walk-ins in the summer months, but during the fall, winter, and spring it is sometimes difficult to get in without an appointment. If you need to cancel an appointment we appreciate at least 24 hours notice. If given less than 24 hours, there will be a charge of 50% of the total cost of services cancelled. Experience the most thorough instructional and educational manicure you'll ever have. You will learn everything there is to know about nail problems, why they occur, how to treat them, and proper at-home maintenance. Includes maintenance, moisture, and choice of lacquer. Includes maintenance, moisture, and your choice of lacquer. Maintenance, moisture, choice of buff to a shine or matte finish lacquer . Sealing of the nail layers, choice of nail lacquer, and oil and lotion. Sealing of the layers, choice of lacquer, oil and lotion. Our pedicures are very thorough. Performed in stainless steel sinks for proper sanitation. Our staff will clip, buff, slough, and massage your feet and calves. This is a completely relaxing experience done in the privacy of our pedicure room. What are you waiting for? Mainteneance, moisture, and choice of lacquer. Just takes a minute! Rid your toes of those annoying little hairs we all have but no one wants to admit to. We will remove old polish, file any mishaped toenails, buff, and apply fresh polish and finish with a nice foot massage. Maintenance, moisture, choice of lacquer. Maintenance, moisture, choice of buff to a shine or a matte lacquer. These are several items we offer so that you may customize your service with us. Feel free to choose one or several to be added on at your next appointment. A deep moisturizing treatment . Perfect for dry skin or cuticles. A popular service for arthritis sufferers because of the penetrating heat. This "customized " facial is perfect for all skin types! 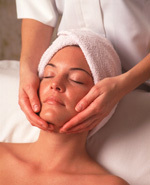 Relaxing and deep pore cleansing, this facial combines exfoliation, extraction, massage, and a hydrating/rebalancing mask . Formulations will be chosen based on your skin condotion. A great way to uncover beautiful, healthy, glowing skin! Your technician will use a scalpal to gently exfoliate your entire face while removing that unwanted peach fuzz that covers your cheeks, chin, and forehead. Once complete, a 20% AHA fruit acid peel will be applied to stimulate collagen and elastin production. Your face has never felt so smooth! Using high level sound waves, the pores are deep cleansed by the vibration of the waves. This deep penetration into the skin promotes cellular renewal and repair as well as helping tone muscles, increases blood circulation, combats puffiness and improves product penetration. This is a relaxing facial that leaves your skin nourished and your fine lines reduced. This is a wonderful skin brightening, anti-aging treatment for non-sensitive skin types. It includes a Vitamin C peel as well as a bleaching mask and a nourishing and smoothing modeling mask. This facial is popular due to the regeneration of fresh skin cells as well as it's collagen boosting affects. It will leave your skin smooth and hydrated. Taylored especially for men's specific skin care needs. Includes exfoliation, extraction, massage and a hydrating/rebalancing mask. Offers protection against irritation from shaving. For teens 15 years and younger. This treatment addresses the issues of young skin, such as oily and acneic skin. Deep pore cleansing, exfoliation, extraction, and rebalancing of the skin will be included. Basic skin care instructions will be offered. Impurities will be removed and the skin will be cleansed and detoxified. This relaxing procedure includes exfoliation, extraction, moisturizing, and massage. Both men and women love this treatment! © 2019 Natural Nail Care Clinic, All Rights Reserved. Unauthorized duplication is prohibited.